As the keeper of Canada’s national documentary heritage, Library and Archives Canada (LAC) collects a wide range of published Canadiana, including comic books. The collection includes not only comics published in Canada, but also comics by Canadian creators published in other countries. Comic books published in Canada are often acquired via legal deposit. But LAC has also received two important collections from private sources that greatly enhance its holdings of Canadian comics. The largest of these is the John Bell Canadian Comic Book Collection. 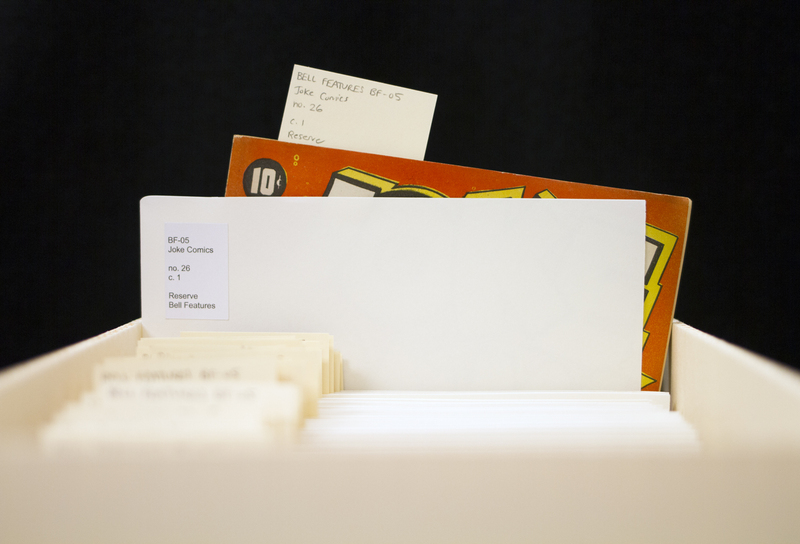 Donated by comic book historian and former LAC archivist John Bell, the collection includes approximately 4,000 comic books, ranging from Second World War era superhero comics to 21st century zines. Currently, the collection is uncatalogued, but a complete list of all items in the first two accessions is available in AMICUS. Second World War era Canadian comics are also well-represented in LAC’s Bell Features Collection, which consists of 382 comic books from the corporate archive of one of the major publishers of the period, Toronto-based Bell Features. These older Canadian comics are extremely rare, and the Bell Features Collection is one of the richest resources available. The collection has been fully catalogued, and a collection-level description listing all the titles is available in AMICUS. Over the last few decades, comic books and graphic novels have been increasingly recognized as a literary genre worthy of serious study. In the 1940s, however, comics were considered “throwaway” books for children, as demonstrated by the fact that many Bell Features comics include games and activities for young readers. Because of their ephemeral nature, 1940s comic books were printed on cheap, poor-quality newsprint. As a result, there are various conservation issues to consider when storing comics. Fortunately, the vaults at LAC’s state-of-the-art Preservation Centre provide optimal environmental conditions. The Bell Features Collection is stored in acid-free, closed boxes that protect the comics from harmful light exposure and dirt. Inside the boxes, each comic book is kept in a paper envelope that is open on the top and front edges allowing the comics to slide in and out of their housing with a reduced risk of catching or tearing on a tight opening. The envelopes also contain an alkaline reserve that helps slow down the harmful effects of the acid in the paper. Listen to the podcast Guardians of the North: Comic Books in Canada to learn more about Canadian comics. This entry was posted in Library, Literature and tagged comics, Rare books by Library and Archives Canada Blog. Bookmark the permalink. Pingback: Comic books at Library and Archives Canada – COMICS BOOKS YOU NEED TO READ BEFORE YOU DIED!